Just like any other settlement in Lombok, the beautiful Indonesian island, the Loyok Village is mainly known for the exceptional wickerwork products. The locals know their way around bamboo and create all kinds of amazing stuff with it, selling it to the neighboring villages and to the foreigners. This is one of those places that aren’t very popular but are quite exciting for the regular visitors. Baskets are the pride and joy of this community, and they work hard to provide for their families. The biggest selling point of their product is the affordable price. For the locals, that’s a lot of money, but for the tourists, it’s pocket change (well, I’m exaggerating a bit, but you get the idea). The Loyok Village isn’t that big, but the people there are very friendly and are always ready to help those in need. The art of weaving is hard to master, and that is exactly why the elders take the responsibility of teaching the younger generations. But with Lombok evolving into a modern-day island, the kids are becoming more interested in getting themselves educated at the universities instead of learning the ancient craft of their people. So, you could say that the ancient techniques of not only weaving, but also pottery, fishing, and everything in between are in danger of becoming forgotten. Without the younger folks to carry on the traditions, they will be lost forever. If you’re interested in one-of-a-kind, handmade items, I’d highly recommend visiting the cute art shops that you’ll find on the main street of the village. When I first entered Loyok, I was amazed by the amount of work these people put into every single basket/bag and simply had to buy a couple of those for my friends back home. When you’re walking along the narrow roads and talking to the locals, it almost feels like you’re in a different world, or, rather, a different dimension. The men and women of the Loyok village don’t seem to be bothered by politics, mass media, and all those things that make a huge part of the lives of regular American and European citizens. And in that regard, they are miles ahead of us. I made friends with a local family and they allowed me to watch the masters at work. I was even given the opportunity to try my luck at weaving, but, unfortunately, I ruined it all. It’s true when they say that you’ll only be able to appreciate the hard work of other people when you try to do it yourself! The village is approximately five kilometers away from Tetebatu, a much more tourist-friendly spot, and is located pretty close to the foot of the legendary Rinjani mountain. As you’ll see on the map at the bottom of this article, it’s pretty easy to get to, and you can even hop on a public bus that stops there. Lombok is a unique place where art, traditions, and religion come together, creating a unique atmosphere of unity and harmony. And, as I mentioned above, crafting is a huge part of its charm. Women bamboo products are among the most popular ones and the craftsmen at the Loyok village are not only good for baskets. They can also make plates, coasters, bags, and even ornaments. Yep, the choice is pretty big, and these items can be used both in the everyday routine and as great gifts. The artistic value of the bamboo craft allowed the locals to enter the international export market, with the biggest Asian countries becoming interested in their work like never before. Handcraft-artists have always been some kind of heroes to me, and the visit to this village was all kinds of amazing. For you, it might not be nearly as exciting, but it’s still worth the while. First, the masters cut the bamboos from the trees. Then, they peel off the thin outer skin. Once that’s done, the “rods” are cut into several equally-sized parts. Now, before the craftsmen get to the main part of the process, the cut bamboos need some time to get dry. The locals put them under the sun and let nature do its thing. The next day, the dry bamboos are cut into several slices. The thickness depends on the product. Once again, they let the slices dry under the sun. For the initial cuts, a big knife is great. However, after the slices are done, the locals use tiny cutters. They cut the bamboo sheets at the top and tear them apart with their bare hands. I did tell you that this is quite a time-consuming job, right? I think most of us would get frustrated and/or bored at this stage, but not the masters at the Loyok village! They spend hours slicing those bamboos until they’re done. Once they’ve got all the necessary slices, the craftsmen move on to weaving. Whenever the potential clients request a motif, the sheets go through the process of dyeing. And for them to be more flexible and “compliant”, they water them a bit. Generally, the locals wet only those parts that they need to bent in order to make something like a basket. 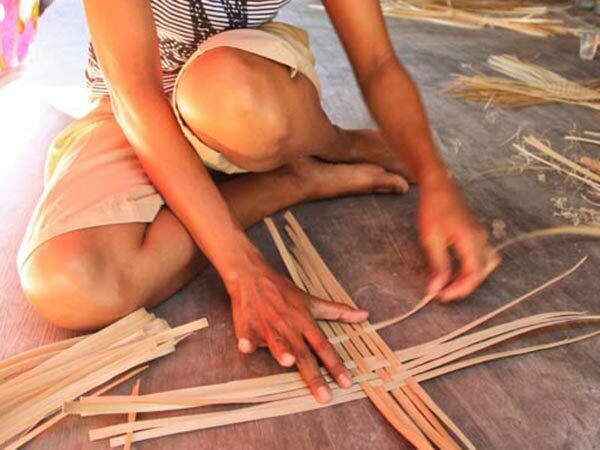 Now, I didn’t mention this earlier, but bamboo is not the only natural material that is used in weaving. Rattan, along with wild grass, is also quite popular. Nothing really changes when you switch from bamboo to the other materials. Cutting, slicing, and drying are still big parts of the process. Dyeing is a very interesting part of the deal, as it gives the items just the right look to attract the customers. The people of the Loyok village use a substance called “PK”. They say it’s pretty expensive and needs special care. Interesting fact: it has explosive characteristics. I have to mention that because of the recent terrorist threats in Indonesia, the government has officially put some sort of a ban on this substance. As a result, its price skyrocketed from 22K IDR to +/- 600K IDR for 1 kilogram. Furthermore, the folks that buy this substance have to get a letter that allows them to use it for dyeing purposes. Powder made from the branch of jackfruit (the tree) is another popular choice. Gambier is also being extensively used by the craftsmen of Loyok. And the more they use, the brighter the bags, baskets, and other weaving products become. The natural color of bamboo is quite popular as well and doesn’t require any dyeing. Summing up, I have to say that this village impressed me. There, I learned what it really takes to keep the traditions of weaving going and how much work the locals put into it. I hope this review was exciting for y’all and will encourage at least some of you to visit it one day. I’m confident that you’ll be amazed by the craft, the people that have mastered it, and their daily routine. This fine settlement is +/- 14 kilometers from Selong (the city). If you just landed at the Lombok Airport, the ride to your destination will take more than an hour. The shortest route is 36 kilometers long; the longest – 42 km long. During the high season, taxi drivers are always happy to give you a lift. Watch out for the fraudsters, though, because the locals really like to come off like big shots and almost double the average fee. If you’ve got some bargaining skills, they’ll be quick to step down and take you there for the normal price. I’m not saying every single driver in Lombok is bad, but, as a general rule, keep your guard up and don’t let anyone fool you. Renting is also a very popular choice. Personally, I think it’s the best choice: come on, this is a once-in-a-lifetime opportunity to rent a motorbike and drive around on a tropical island. When are you going to get a chance like that again? From Mataram, the capital of the island, the ride will take 1, 5 hours if not more. So, get yourself ready for an exciting drive through the picturesque nature of Lombok. If you’re traveling with your friends, split the cost. The infrastructure around the Loyok Village is advanced, which means you won’t have any problems finding a restaurant, a café, or a nice hotel room to stay for a night (or for a whole week). I never thought that weaving takes so much time and energy, not to mention the skills. I was definitely impressed by this village! Loyok is just another settlement until you watch the masters at work. I also tried my best at weaving but failed miserably. When you're standing in the middle of the Loyok village, everything feels different. It's a magical place; plus, it's very beautiful. For this kind of effort, the prices of the bamboo products are more than fair. We bought a bunch of stuff from the locals for our friends. Thanks for letting us know about amazing villages like this one!